Terror in Meeple City plays like someone stitched King of Tokyo and Cube Quest together before filling the resultant monstrosity full of fortifying electricity. 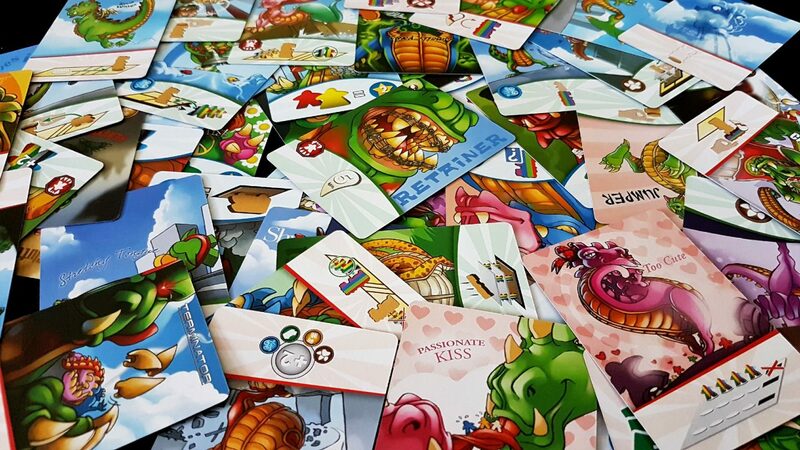 Technically even the title is incorrect – properly it is Terror in Meeple City’s Monster. There’s a lot of anarchic fun to be found in the box as we indicated in our three and a half star review. Fittingly for a game that is about causing as much destruction as possible to an innocent city, we’re going to emulate the gameplay by tearing down any accessibility edifice into which we can get our fingers. There’s no runaway tracker here – nobody escapes the carnage of Meeple Like Us. Now, this isn’t quite as large a problem as it might instantly appear. The yellow meeples have a different form factor (although we’ll come back to that in the socioeconomic section) and if you have the patience of a saint you can add more differentiating information through the application of the optional stickers that are available in the box. This gives me flashbacks to Village. I haven’t done this because, thankfully, life hasn’t gotten quite so grim that applying 180 stickers to 90 meeple is the only available form of entertainment I have available. I’m still having flashbacks to my time with Village. 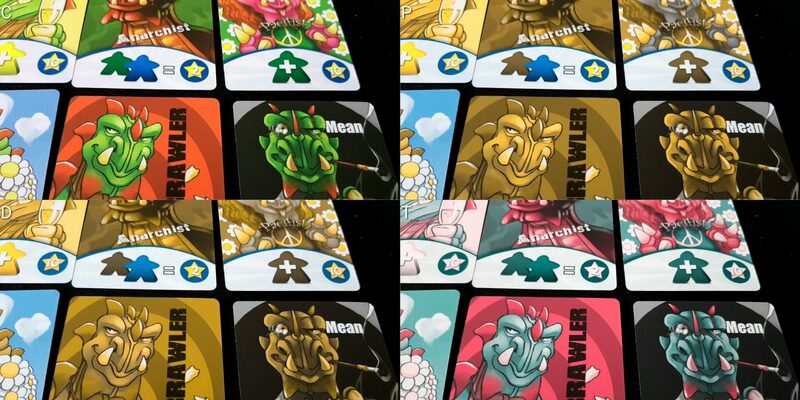 However while these provide different visual identifiers for each meeple they are still primarily identified by colour. Close inspection does become more effective if you do this, but working out meeple at a distance is still roughly as difficult especially when assessed from the rear. An unfixable problem is in the board itself, which makes use of colour to identify the particular regions within which monsters operate. Fences or walls are used to separate these on the board, but colour is easily the key way in which you can see in which section you are currently operating. For those with Protanopia or Deuteronopia the red, yellow and green sections all merge together into a roughly contiguous mass. 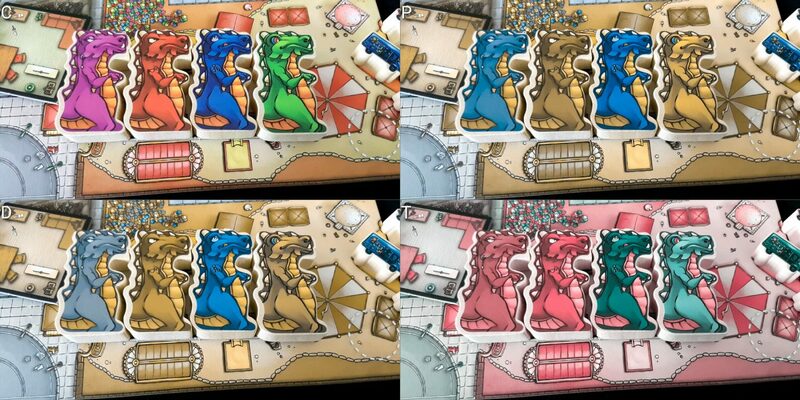 You can identify which section each monster occupies, but what is an effortless task for most players becomes one of board inspection for those with colour blindness. To be fair, each section makes use of a different aesthetic metaphor (trees for the green sections, beach umbrellas for the orange, and so on) but again it comes down to close inspection to see where you are instead of the board telling you by colour codes. This will become easier with familiarity, but it’s still an unfortunate oversight. This carries through to the monsters – there are very slight differences between these, but not so much that the colour won’t be the primary way in which someone can identify which is which. In case you don’t see it yourself, the third monster has a stuck out tongue, the first monster has seductively lidded eyes and long eyelashes, the fourth has vari-coloured eyes, and so on. They each have different tattoo or tribal markings on their arms, or other small adjustments. The problem is that for smooth play you’ll be identifying by colour, not graphic design. This needn’t be a major problem during play – you can after all just ask which is your monster. It shows though a degree of carelessness in colour design that could so easily have been handled better. A final area where there are problems are in the cards that give you powers and extra scoring opportunities. 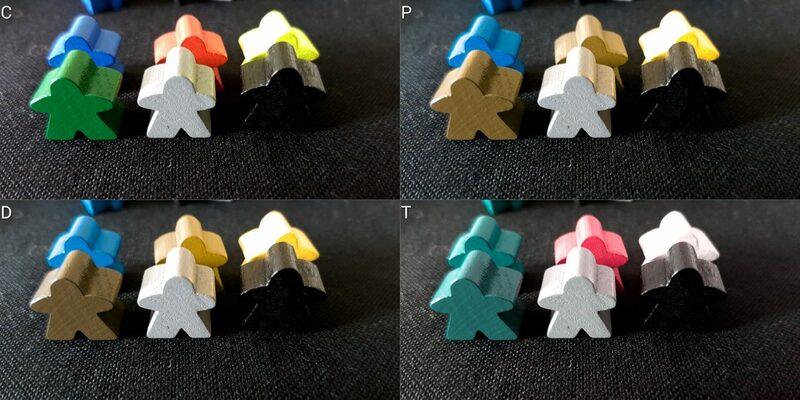 Sometimes the meeple indicated on these are not unambiguous, and since they relate to colours on the board it can make it difficult to identify the scoring context for colour blind players. Again, this isn’t a game breaking problem but it does add a burden onto colour blind players to be constantly checking to see how their character cards influence their options in front of them. As might be imagined, the colour of the vehicles too lacks differentiation, but these at least have no effect on play other than placement. Technically then, technically, Terror in Meeple City doesn’t have a game breaking problem when it comes to colour blindness. If the will is there, it is fully playable with support. Only in a handful of places is colour the only information channel. Sometimes though the supplementary information is not substantive enough to offer a reasonable alternative if the fluidity of play is to be preserved. The game has so many colour problems across the board that we don’t recommend it in this category. There are too many other games that can be played without the extra necessary effort. This is not a game that I think would offer much joy for people with visual impairments. If the impairment is notably minor then it’s probably roughly playable, but important elements of discrimination here include depth perception and binocularity. For throwing vehicles or flicking paws, you need to be able to get the object to land where you want it to go. It’s tricky enough for those with full sight – the less that sight can be assumed, the harder the game becomes to recommend. As someone that wears varifocal lenses, even the change in focus associated with those can have a real impact on how accurate your flicking can be. While the board isn’t especially big, distance is a factor and this is a multiplier on the problems of accuracy. Two of the activities don’t necessarily need a lot of visual acuity, but they still benefit from its presence. Dropping a monster onto a building is more effective if you can judge points of weakness in the structure, and blowing pieces around is more feasible if you can assess where they’re likely to end up and how that impacts upon your own strategy. Both of these actions would be perfectly possible for a visually impaired player, but the consequences of the interaction are going to be more difficult to judge. Simply assessing the state of play can be tricky too because it extends over the board and is represented in three dimensional layers. Knowing where particular colours are to be found is important for the set collection element of scoring, and knowing where meeple have fallen in your region (and outside) is key to knowing where is best to move. 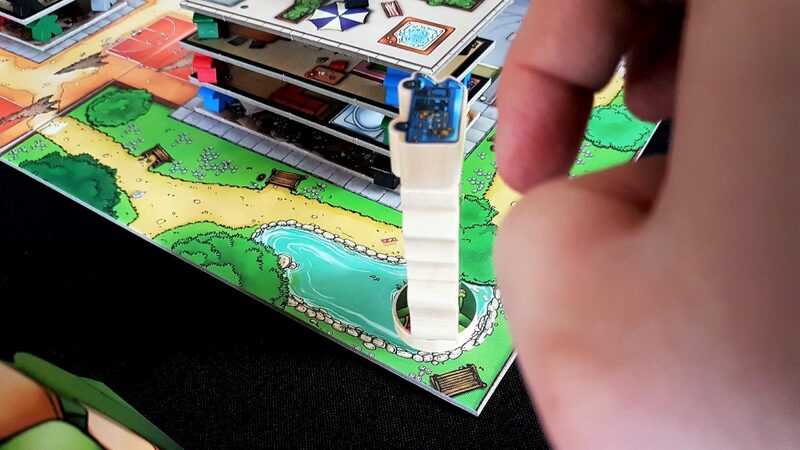 Roofs only become consumable when they are no longer supporting game elements, and even the leg of a meeple counts for that. The position of a monster on a sidewalk requires players to identify the overlap between the disc of the paws and a small grey strip around the foundation. These kind of relatively minor identification challenges mount up as the game continues. There are some remarkably poor contrast choices too associated with erecting the buildings during setup. 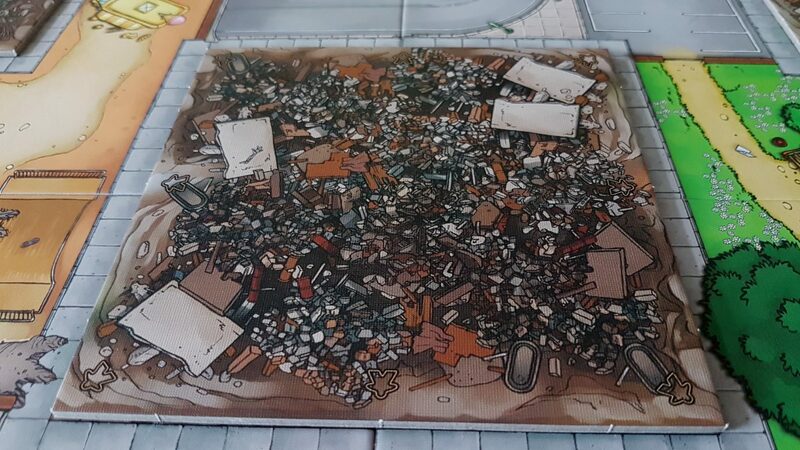 This isn’t actually a problem since it’s just ‘four meeple to a structure, except for the big one in the centre’ but the guide-marks show an indifference to visual accessibility that I thought was worth mentioning. There are eight marking for meeple here – can you see them? The cards at least are visually distinct, employing good contrast and a symbolic language that obviates the need for text. However, a counterpoint to this is that some cards make use of decorative fonts to name their effect, and the orientation/location of the text varies from card to card. This can make it more difficult for players to check the associated chart as to what the symbols actually mean. For characters and powers this isn’t an issue because you can just ask – for secret superpowers, those should be hidden and any inquiry would leak gameplay information. 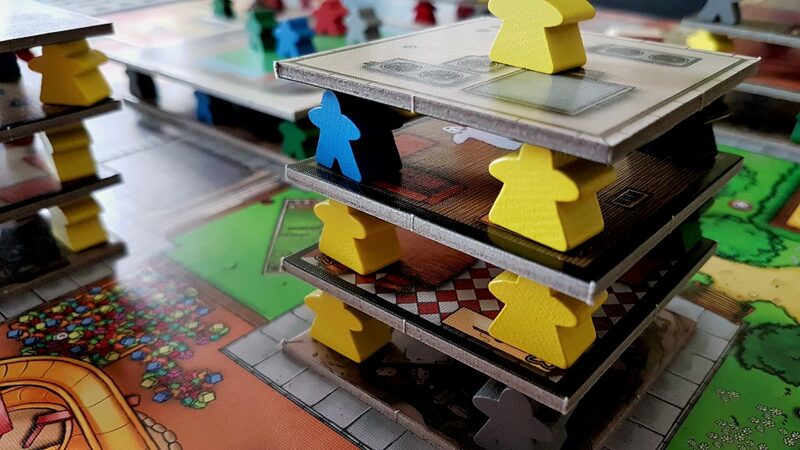 Overall, we strongly recommend players with visual accessibility requirements avoid Terror in Meeple City. Terror in Meeple City thrives here, for the most part. There are four simple core actions that players can take, and while the characters and powers complicate that there are numerous ways their impact can be lessened. The game is fun enough with just the core gameplay rules if you wanted to leave the cards out, and you could use only the simpler cards if you didn’t. There are some cognitive complexities associated with scoring. The need to collect sets of colours adds a tactical and strategic consideration to your path of destruction. You can instead simply count each meeple as a point, which then keeps a competitive element while making it cognitively inexpensive to play. The only area there is a cognitive cost is in processing the symbols on the cards, and as discussed above making use of these is optional – the game is still fun without them. I know, because during several games I clean forgot to use my powers. The enjoyment comes in the physical act of destruction, and that is as simple as lifting something pleasingly tactile and then dropping it somewhere interesting. The addition of breath attacks too means that the game doesn’t even need complex rules for dealing with survivors and movement. If you want people to leave a building, you just blow them as hard as you can. Uh. Mental note – reword that before publication. We strongly recommend Terror in Meeple City for both categories of cognitive impairment. 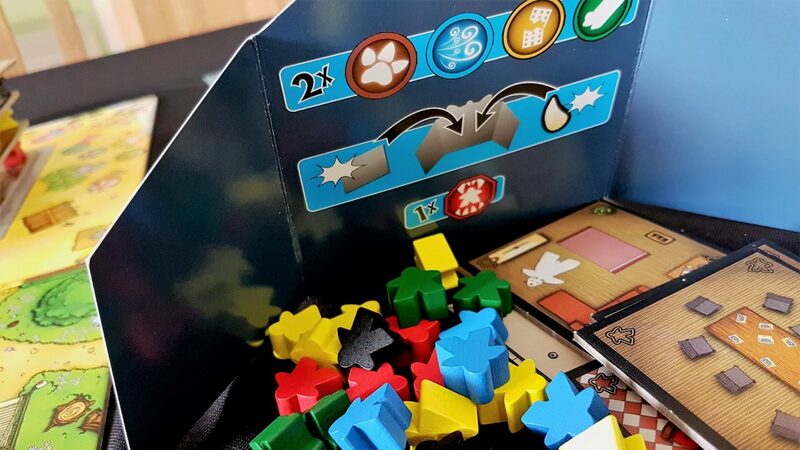 There are a number of potential emotional triggers in Terror in Meeple City but the general tone of the game is sufficient to nullify their likely impact. Let’s go through them though to see where you might want to be a little wary. First of all, the game offers a direct PvP experience by letting monsters knock each other down. When this happens, the monster that went on the offensive takes a tooth from each inconvenienced beast. This means they’re less effective at taking down meeple, and the attacking player gets a couple of points at the end. The impact otherwise is minimal. There are a few ‘take that’ moments permitted by powers and superpowers, but few if any that are likely to seriously undermine anyone’s fun. The game doesn’t even really permit a great deal of ganging up. Attacks can only happen once per round of play (the monster is put back on its feet at the beginning of its turn) and requires a confluence of opportunity and skill to carry it out. In a mean spirited group it’s certainly possible for a monster to end up with only its two front teeth (the minimum the game permits) but otherwise it’s unlikely to be a major issue for play. Score disparity can be considerable, and is tightly bound up in how well players have managed to collect sets. 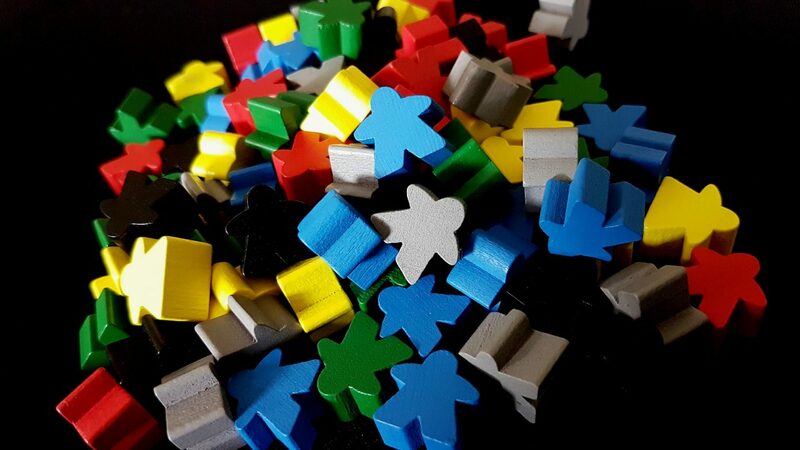 The sheer number of meeple consumed is secondary to the extent to which they line up with scoring conditions. This can lead to a situation where the monster that worked the hardest receives the fewest points for their effort. Really though the game isn’t about winning – it’s about causing damage in the most enjoyable way. Those looking to play ‘to win’ will find opportunities to make it happen, but it is very much playing against type for a game like this. Those of an especially sensitive disposition may find the theme a little problematic – after all, you are playing the part of monsters explicitly eating people. Every action you take is a cartoonish take on a Cloverfield type scenario – great, giant beasts wrecking a path of death and devastation with every step taken. The implementation of every aesthetic and mechanical element here helps abstract away from the reality, but in some edge cases this might be a point of concern. I honestly don’t think it’s a major problem but as always you will need to assess this in light of your own gaming context. Overall then, we recommend Terror in Meeple City in this category. This is, as I’m sure you could guess, a serious problem area. Let’s look at it in terms of fine and gross motor control, and the expectations laid upon players for both. For fine control, this comes into play when flicking discs, throwing vehicles, and to a lesser extent dropping monsters on buildings. For the latter, the key element of physical skill is mapping the position of the monster to the specific point you want to attack – often the corners or edges of buildings. If fine control is limited, then there is a significant chance that unintended movement at the point of release is going to seriously impact on the outcome. For flicking discs (movement) and vehicles you have the obvious difficulty of coupling precision and power in such a way as to accomplish a game goal. Flicking vehicles is a targeting exercise which needs you to perform physical interactions within 3D space while taking into account trajectory and gravity. 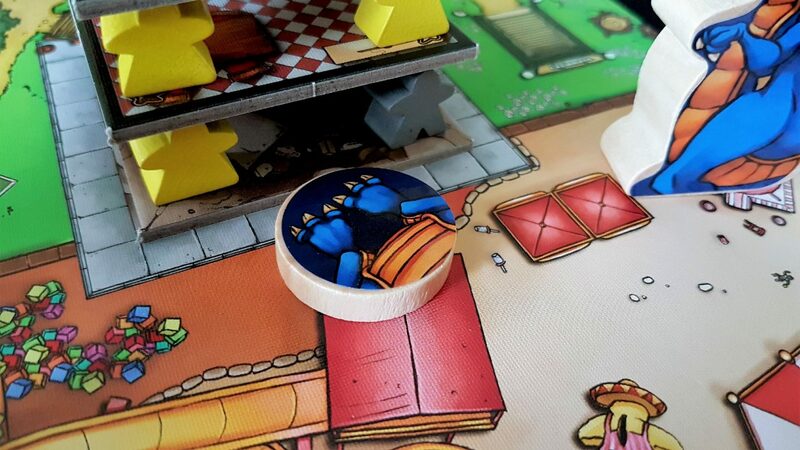 When meeple are knocked off the board, they don’t just disappear – they go into a runaway tracker that will come back to bite someone when it reaches certain thresholds. Unlike within Cube Quest you don’t just lose the cube – there are lasting penalties for imperfect attacks. For gross motor control, we encounter the same issue we’d see in a game of pool. You need to orbit the board to get access to monsters, and some of the specific interactions you perform need you to get very close. Breath attacks require you to rest your chin on the top of the monster, and if the board is in the centre of a table it might be difficult to accomplish this if you’re trying to reach it from the far edge. You can’t just draw the board towards you either – doing so would run the risk of seriously changing the game state. The act of flicking discs and vehicles needs you to be able to angle your fingers and hands for maximum effect, and that’s going to mean getting up and moving around the table. Sometimes it’s going to mean reaching over, or climbing up, on furniture. Think of a professional snooker player going for a difficult break, leg up on the table as they try to achieve the optimal angle. That’s Terror in Meeple City. There’s an interesting new issue here as well – lung capacity is a non-trivial factor when it comes to making breath attacks. Being able to get a good lungful before blowing is going to have a major impact on the efficacy of that particular action. This is I think the first time we’ve seen an issue like this come up in our teardowns. Almost every game we look at here has some unique element to it. Those that require respirators or other breathing aides may find this difficult or impossible to do, but this is an area where another player could be realistically asked to act on another’s behalf. So, the game would only be appropriate if you have fine-grained motor control and no problem walking around a mat, assessing it from all angles. That’s basically saying ‘It’s only physically accessible if you have no physical impairments’. That also holds 100% true here. Similarly, the notes we made on verbalisation for cube quest are also true – it’s largely a non-starter. While you can usually unambiguously issue an instruction because of the requirement for adjacency to buildings, there really isn’t a lot of fun in having someone else enact these actions on your behalf. Even if there was, you’d need to rely on their ability to meaningfully and fairly execute your instructions. We can’t recommend Terror in Meeple City in this category. The manual adopts explicit gendering throughout – it’s quite a short manual though so the effect isn’t egregious. Still, it’s never necessary and is always unwelcome. But let’s just skip past that because I want to talk about the meeple designs. Each type of meeple has a particular archetype it represents. Black are businessmen (and they are always men). Grey are ‘old people’ and the sticker art shows an older gentleman with a long white beard. Blue are journalists, green are soldiers, red are heroes (although a particularly useless brand since they get eaten as easily as any other). 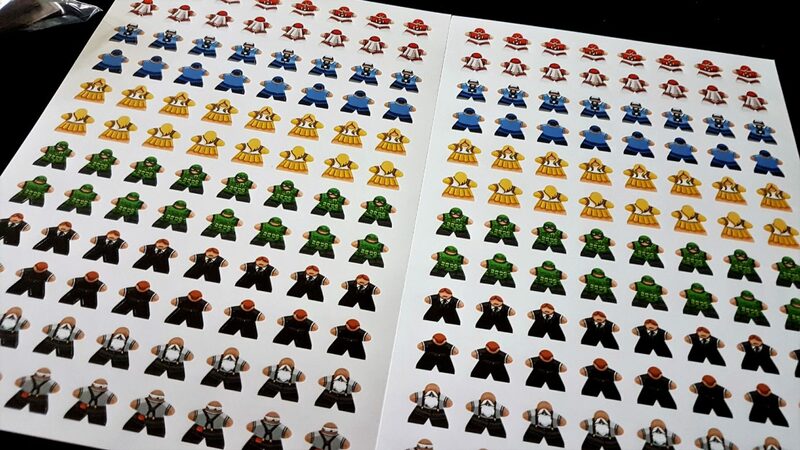 The sticker art associated with each is explicitly male. That’s not to say women aren’t represented, because they are. The yellow meeple are explicitly female (in stickers and in meeple silhouette) and referred to as blondes. Not only do they get an objectified identifier they are also the only meeple form with skirts. If at the end of the game you have eaten more blondes (yellow Meeples) than each other monster, score 10 victory points. But that’s not all! Because we have a female monster here, and unsurprisingly she’s the hot pink monster with earrings and long eye-lashes. You probably remember her from the section above on colour blindness. You could say ‘Dude, you’re projecting your own gender assumptions here’, and that might even be true. But don’t call me dude, you’re not a nineties surfer bro. But let’s be honest – a game that renders women down into ‘blondes’ isn’t likely to be expressing particularly progressive gender politics. It all just conforms to really tired, dated assumptions of gender roles and gendered colour coding. And yes, the usual objections hold true here – just a game; ‘it doesn’t bother me’; ‘don’t get so wound up about a bit of fun’. If it doesn’t bother you, that’s fine. However, it is going to bother some people and it probably should bother more. Terror in Meeple City retails at an RRP of £45, which is quite expensive. You do get a decent number of high quality components, but it’s still a game that plays only up to four players at a time. You will get a lot of fun out of it, but perhaps not without mixing up your gaming groups a little. As you introduce it to new people you’ll find each time it gets a new injection of freshness but it likely doesn’t have a lot of staying power otherwise. Still, it’s also easy enough and interesting enough in an elevator pitch to potentially open up the hobby to people that are resistant to even simple gateway fare like King of Tokyo or Ticket to Ride. We’ll tentatively, just, recommend Terror in Meeple City here. There’s no formal need for communication during the game, and no reading level associated with day to day play. However, if communication impairments must be taken into account it’s important to consider the underlying factors. Some communicative restrictions are related to physical factors such as lung capacity, and in that case Terror in Meeple City might not be optimal because of the breath attack action available to players. However, in this specific circumstance it might be okay for someone else to act on another player’s behalf without it impacting too significantly on the enjoyment of the game. We’ll recommend Terror in Meeple City in this category. For the most part there is no intersectional issue that would invalidate a baseline recommendation. We don’t recommend it for people with colour blindness, visual impairments, or physical impairments. Any compound condition is only going to intensify our view in any of these categories. We tend to consider issues of downtime here as a relevant factor for the intersection of emotional and cognitive accessibility. While there’s a bit of downtime the sheer spectacle of play is such that it’s unlikely to be a problem. It’s fun to just watch other people smash up the city – even if you’re not directly impacted by their actions, you’ll enjoy seeing them act upon them. Observing success in this respect is fun, but even better is watching people fail to accomplish a goal – especially if it’s an easy one. As such, downtime is an enjoyable spectator pursuit. 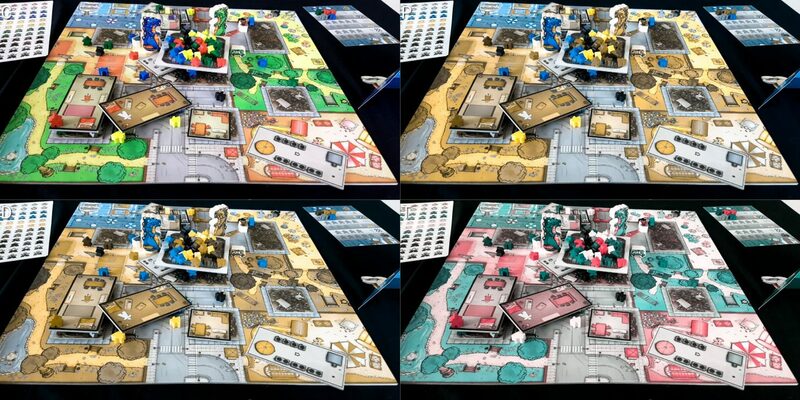 Game length is something more of an issue – while play is generally pretty brisk (between 45 minutes and an hour) there is a set up cost that goes with putting the city together. It’s not onerous when everyone chips in and knows what they’re doing, but it’s still something to bear in mind – especially if accessibility considerations must be taken into account. It’s entirely possible too for parts of the setup to need redone depending on how confidently the construction has been accomplished. Wavering buildings and the like need straightened up, and occasional oscillations of a table can lengthen the setup time. I wouldn’t say it would take more than maybe five or ten minutes (depending on familiarity and complicating factors) but it does add a chore to the beginning of play that might cause problems. Well, It’s not an overly inspiring performance but Terror in Meeple City still does better than many games we’ve looked at on the blog. Dexterity games such as this are never going to be great candidates for those with visual or physical impairments, but there are also a few accessibility blunders here that drag it down from a higher ranking. The colour palette is one obvious area where easy wins are available, but the tired tropes of ‘blonde victims’ and ‘pink monsters’ are also easily fixable. A bit more inclusivity in the language, a little less leaning on dumb clichés, and it would accomplish better results in the category of socioeconomic accessibility. Terror in Meeple City is a simple, fun game of focused carnage. We liked it to the tune of three and a half stars. While it’s far from a good fit for many players with accessibility requirements, for others it really does offer a lot. If you’re looking for a dexterity game that is easy to learn, fun to play, and likely a hit with mixed audiences then you could do a lot worse than this.